I’ve already made my semi-defense of Tim Geithner’s toxic waste buyup plan, and I won’t repeat myself here. But there is one point that I think deserves a post of its own. It’s this: Do supporters of bank nationalization really think it’s either legally or politically feasible at this point in time? I’m skeptical on both counts. Legally, I’m not sure Obama has the statutory authority to take over a big bank. He may well need congressional authorization of some kind first. And even if he doesn’t, does anyone really think it would be wise to go down this road without broad congressional support anyway? I don’t. Like it or not, there’s only one way to get this support: show that (a) one or more of the big banks really is insolvent and (b) every other option for rescuing them has been exhausted. Geithner’s plan does both. If it works — well and good. But if it fails — if nobody is willing to participate, or if the auction demonstrates that the market price for toxic assets really is accurate — then banks will be forced to mark their assets to those prices. Plug in those marks to Geithner’s stress tests and it’s likely to prove to everyone’s satisfaction that some of our big banks really are insolvent. 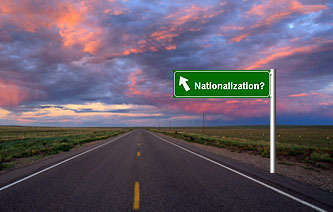 At that point, even skeptics will be forced to accept nationalization as the only remaining alternative. Politically, I don’t see any other way forward. Bank nationalization will be complex, costly, and contentious. To work, it will almost certainly have to include a broad guarantee of all bank system obligations, something the public won’t be happy about. Congressional support won’t be easy to come by. Geithner’s plan will either work or else it will pave the road for that support. It might not be pretty, but that makes it a plan worth trying.